What’s happening down at the Rocky Mountain ATV/MC AMA Amateur National Motocross Championship, presented by Lucas Oil? Here’s your handy cheat sheet. Read up to sound like an expert on amateur moto. These days, some top A riders graduate from the amateur ranks early and make their pro debut at the Lucas Oil Pro Motocross opener at Hangtown. Garrett Marchbanks and Jordan Bailey did it this year. This makes the B class often the most important class at the Ranch because it’s the last stop where you can guarantee all the biggest names will still be in competition (Marchbanks, for example, raced B last year and skipped A at Loretta’s completely). This year’s outstanding B rider so far is Rockstar Energy Husqvarna’s Jalek Swoll. He’s won three of his four motos so far and was two laps away from winning all four of them, sans a tip-over while leading with two laps to go. He hasn’t been quite as quick as Pierce Brown, but he’s nailed his starts and kept the mistakes to a minimum. Coming into the race, a lot of the B class attention focused on Troy Lee Designs KTM’s Pierce Brown, who is considered by some scouts as the fastest amateur in the country. Well, Brown hasn’t disappointed on the speed front. His lap times have been crazy fast, and he indeed holds the fastest lap time of the week so far. However, he’s also crashed a bunch. He had two crashes in a Tuesday moto, so he came into Wednesday focused on wins. In 250 B, he caught Swoll in a battle for the lead and put some pressure on, but Swoll didn’t crack, then Brown tangled with a lapper and went down. Later in the day, Brown was even faster in Schoolboy 2, throwing down a ridiculous 1:52 flat. No one else even went under the 1:53 mark. But Brown ended up crashing three times, and Swoll took another win. The Loretta’s track shaped up beautifully on Wednesday morning, and that led to amazing racing with two or more equal lines in every corner. The Girls (11-16) class provided a prime example, and Jazzmyn Canfield and Taylor Allred put on an incredible duel, passing each other back and forth throughout the race. On the last lap, Canfield had the lead but went off the track and sliced across the start straight to get back on it. Race officials determined she gained too much time in doing so and penalized her three spots. Meanwhile, at about the same time Canfield was trying to get back on the track, Allred’s bike started smoking and slowing. Allred limped it across the line in second, but with the Canfield penalty, she was awarded the moto win—despite her bike barely getting across the line. The third and final 250 A moto at 10:30 a.m. on Friday is going to be insane. Following a wild second moto, four riders have a shot at the title heading into the finale. In moto two, first-moto winner Seth Hammaker went down in the third turn and had to mount a comeback, with Tanner Stack right in front of him most of the way. Stack got to third, Hammaker to fourth. 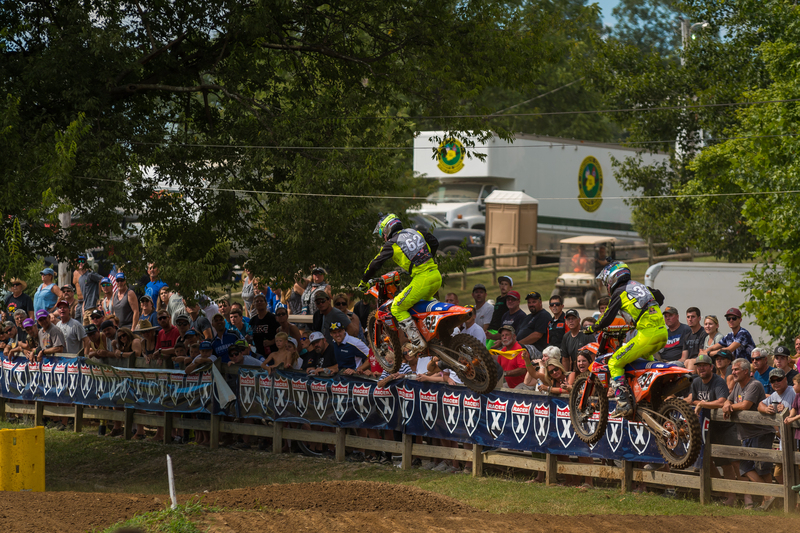 Up front, Mitchell Falk led the whole way, but his TLD KTM teammate Derek Drake started about tenth and logged strong laps to get to second and close the gap. The teammates were wheel-to-wheel for the lead on the last lap, and Drake lined up a pass on the outside of the last turn. A lapper drifted into his path, though, and allowed Falk to escape with the moto win. Drake now holds a 2-2, Hammaker a 1-4, Falk a 4-1, and Stack a 3-3. The Supermini classes have become a premier division at the Ranch, as the advent of the 250F makes the leap to big bikes—for some riders on some brands—a little larger, so they’ll often stay on the smaller Supermini one extra season. That packs more talent into the class, which makes wins there an even bigger deal. 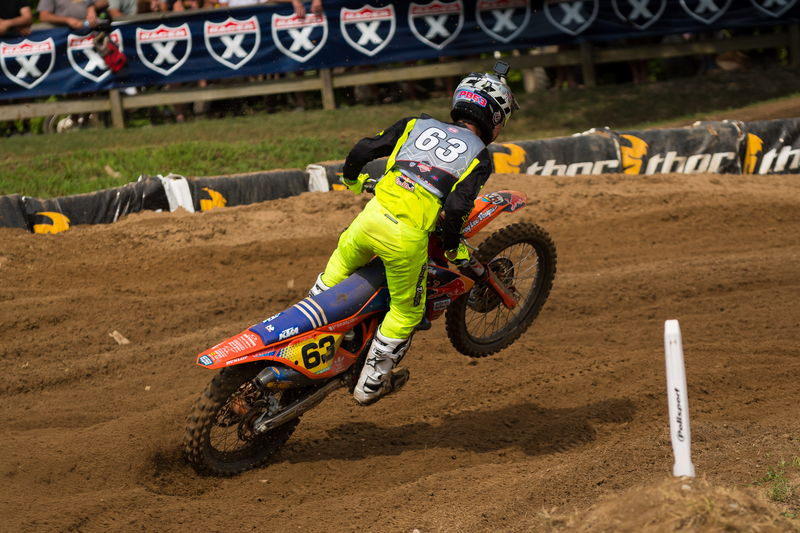 So this year’s big deal, then, is Nate Thrasher, who has, yes, thrashed the Supermini field in his first two motos. Thrasher looks gigantic on the Supermini, but his lap times are tiny—nearly as fast as B riders on 250s. Fellow KTM rider Max Vohland has been second-best in the two Supermini classes, but even though Vohland is riding well, he’s a few seconds a lap off of the stuff Thrasher is throwing down.